I'm trying to get Photon Voice 2 to work in my project. I'm Using Unity 2017.4.1f1 and Photon Voice 2.3 . I tried to import Photon Voice 2 directly in my existing project, but had many errors so I'm starting from a new/clean project as you suggested in other posts. 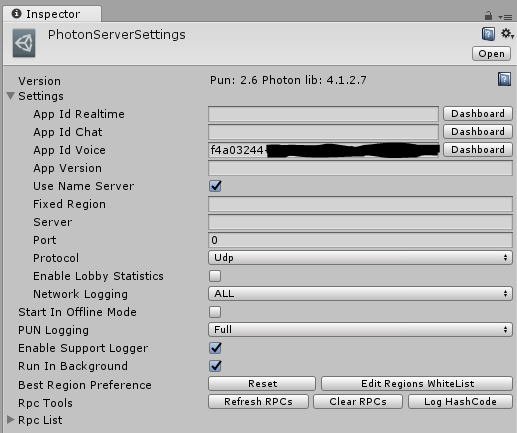 In new project only thing I've done is importing Photon Voice 2 and setting the AppID for Voice. 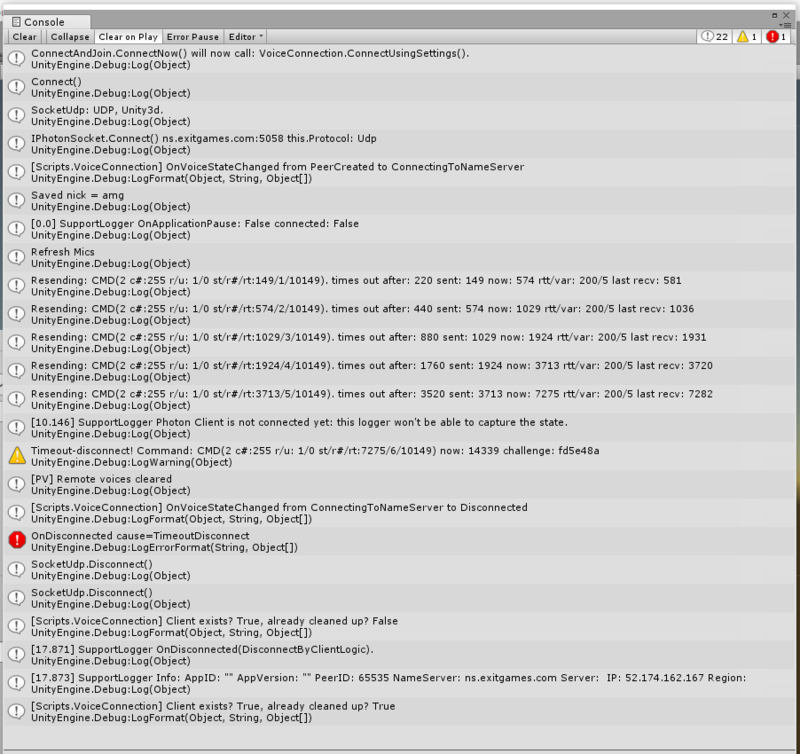 This is a tipical log running the DemoVoice scene. I guess you are using DemoVoice scene from DemoVoiceUI? It looks like the AppId was not properly set but maybe that's not the cause. Could you take a screenshot of the AppSettings? Do you use PUN2 Settings? Also, make sure ns.exitgames.com:5058 is reachable from your network. See "Analyzing Disconnects (Timeout Disconnect)" and "TCP and UDP ports". It seems I can't reach ns.exitgames.com:5058. I tried ping, an online telnet service and an online udp ping service. How could I check reachability of your server? You need to try in a different network that can reach our nameserver. I tried on different hardware that has some different network configuration (don't know precisely what differs) and it worked instantly. Thanks so much for the fast responses!